This page provides you with Customer Service resume samples that you can use for inspiration in writing your own resume, or for creating one through our easy-to-use resume builder. Below you'll find our how-to section that will guide you through each section of a Customer service resume. For individuals who have strong communication, problem solving and time management skills, and the ability to connect with and understand others, may be well suited for a job in customer service. The job outlook for customer service representatives is fairly positive according to the US Bureau of Labor Statistics. With an expected growth rate of 5% over the next decade, which is on par with the average of other jobs, this sector is likely to offer decent job opportunities. The first step in obtaining a job as a customer service representative is to create a resume that is tailored to the industry. We've explained in detail the key resume elements of the samples provided above. In this customer service resume sample, the applicant does have relevant skills but does not have much work experience. The resume still does a good job of highlighting why the applicant should be considered for the position. This resume uses two colors of font. In general, applicants shouldn’t make their resumes too colorful, but this consistent color-scheme is professional and adds organization to the document. Name: The name line is fairly straightforward. The main takeaway here is that the name should stand out. It should be in a larger font size and bolded. 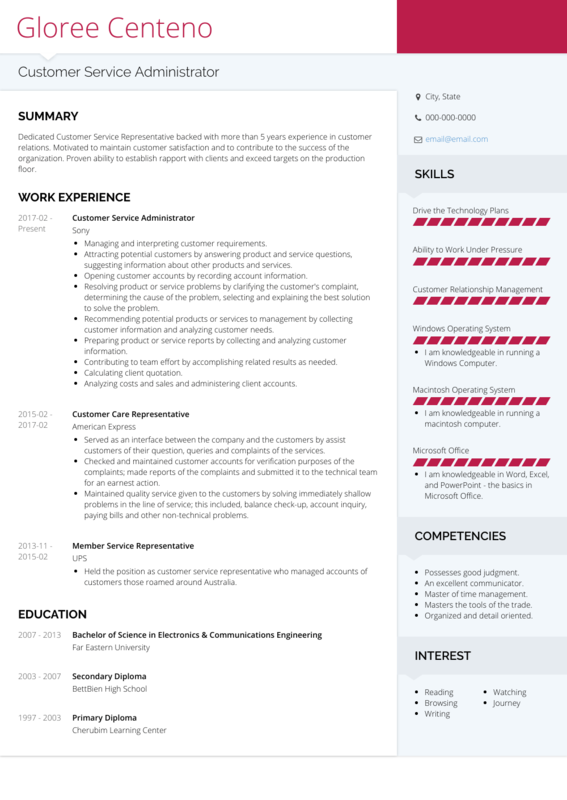 This resume uses a different color for the name which is okay because this formatting is continued throughout the resume. Headline: The headline should be a short phrase that summarizes the applicant’s professional experience and skills. This headline should also be consistent with the job posting. Don’t use the job posting title, but it should be clear from the headline that this individual has or could serve as a customer service professional. The headline should stick out, but it should be smaller than the name. Contact Information: At minimum, this section should include a phone number and email address. It’s also good to include city and state so the recruiter knows if the applicant is local. Non-local candidates may face an additional hurdle because customer service positions don’t typically offer relocation packages. If an applicant it willing to move, he or she should indicate that in the complete application. This section should be the same size and color as the majority of the text in the resume. Summary: What used to be called an Objective section is now referred to as a Summary section. Instead of stating career goals, the section focuses on providing recruiters and hiring managers with a snapshot of the candidate’s experience and skills. This is a chance to explain how all of the pieces of the resume fit together. It is a place to brag and highlight achievements that are especially relevant to the job posting. Areas of Expertise: This section is a short list of bullet points that list the most important skills the candidate has that are relevant to the job posting. As far as formatting, the list should be short and split into uniform columns. Projects and Volunteer Work: Even if you don't have a lot of work experience, this customer service resume example shows how to list volunteer and project experience instead. The section is arranged as other experience sections would be with dates of employment, position title, name of organization and its location. Below this basic information, list clearly what has been accomplished in each of these roles. Education: The education section should be organized with the most advanced degree on the top. In addition to the date of graduation, program of study and university name. You can also list some coursework that is relevant to jobs in customer service. This is another way to expand upon skills even if a candidate doesn’t have a lot of work experience. Training: This section can be used to highlight any additional skills and experiences that don’t neatly fit into another category above. It’s most common that this section would be used by someone with less experience in the industry. Candidates could use either customer service resume sample and customize it to their background, experience and skills. However, the first example tends to work better for more junior employees while the second one for more senior workers. Both resumes are clear, professional, organized and impactful. They cover the most important information in a concise way that is appropriate for the industry. As candidates update their resumes, they can always reach out to resume services for help. At minimum, it’s important to have someone else review the resume for any errors, typos or misunderstandings. Good luck with the job search!